Are you on the hunt for home renovations that will boost usability and value? Look no further than that unfinished basement. In this article, we’ll show you how to turn that dusty cave into an amazing new living space. Note: finishing a basement isn’t the easiest job. For most basements, it’s a lot more than a weekend do-it-yourself project. If you’re not comfortable with construction be sure to enlist the help of a professional. The first step is to plan out how you’re going to use the space. Are you going to make an office? A full suite? Is there any plumbing or wiring involved? Will you need to create full walls? Map out how you plan to use the available space so you have an idea of what you’ll need. Once you figure out how you’ll use the space, you’ll need to measure everything out. Height can be an issue — especially in basements not designed as a living space. You can solve height problems by digging out the concrete slab. Once you get down deep enough, you pour a new slab. Is the basement at a good height? Next you’ll need to start framing everything in. Depending on how you have your walls mapped out, this might take a while. You may also need permits or to enlist licensed tradespeople, such as an electrician. If you’re just framing in a single room to add walls, it will be easier. After the framing process, you’ll insulate everything before installing the walls. Adding insulation can drive energy and heating costs down by a lot. So much so that in colder areas of the country, new homes must have insulated basements. After the insulation is in place, you’ll install the drywall and ready the walls for painting. The final step is to get everything painted and finished. If you chose to go with a carpeted floor, you’ll want to save this for last. Once the painting is complete, install the carpets, baseboard and trim. Touch up any final areas and you’re all set. 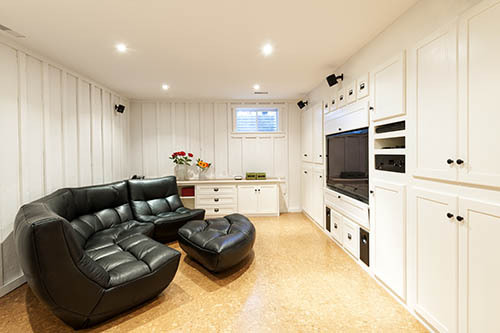 Finishing your basement into a usable space is an excellent way to add value to your home. To learn more about building your home’s equity, give us a call.